Do you know about the Yestermorrow Tiny House Fair? I have an exciting announcement! 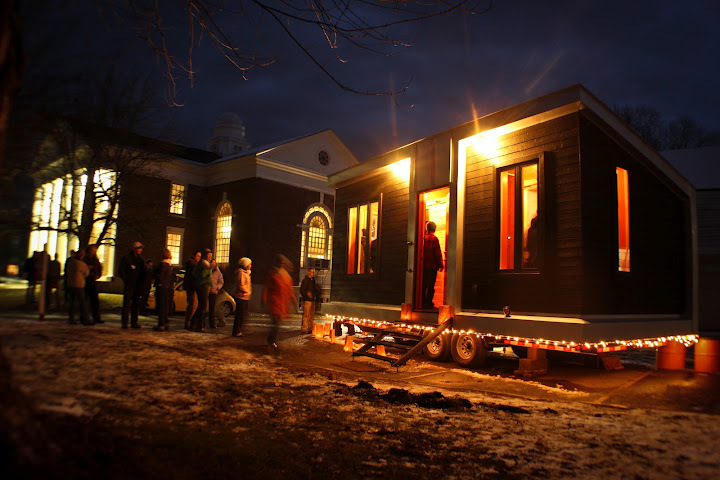 Although the wheels have been turning on this for a few months now, I want to remind all tiny house and sustainable building/design lovers about the Tiny House Fair that is happening at Yestermorrow School in Waitsfield, Vermont this summer. Here’s the scoop from the Yestermorrow website. And I’ll be there with the COMET, and giving a talk about small-scale solar power for your tiny house. 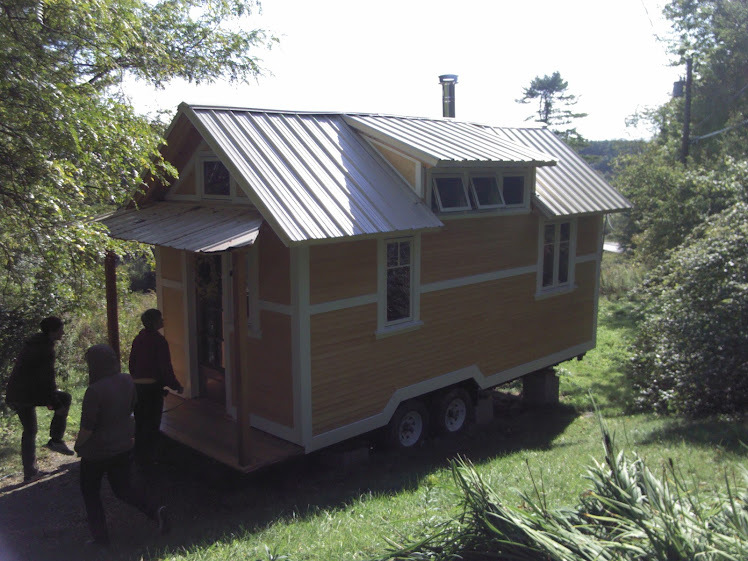 Yestermorrow is thrilled to host the first ever Tiny House Fair next spring, June 14-16, 2013. Register Now! Come to the Tiny House Fair to learn about and celebrate tiny houses! Join leaders of the tiny house movement, including Jay Shafer, founder of Tumbleweed Tiny House Company and Derek (Deek) Diedricksen of Relaxshacks. Cost: $300 General Registration, includes all workshops, presentations, and meals. Dates: The fair starts Friday evening 6/14/2013 with dinner and a speaker, and ends Sunday afternoon 6/16/2013. Workshop Schedule: See http://tinyhousecommunity.com/fair.htm for a full schedule of workshops and presenters. Meals: The registration package includes Friday dinner, Saturday breakfast lunch and dinner, and Sunday breakfast and lunch. We walk the talk of sustainability by purchasing local, organic, nutritious, and wholesome ingredients. The meal plan includes vegetarian options at every meal. Register Online or call us at 802-496-5545 to secure your spot at the fair. We are limited to 100 participants. Definitely check out the schedule of workshops over at Tiny House Community….all of the tiny house greats will be at this event. Jay Schafer, Derek Diedricksen, Alex Pino, and so many more. Here’s a beautiful tiny house built by Yestermorrow students. And if you haven’t checked out the Yestermorrow website or their course offerings before, you should! I can’t say enough good things about them. I haven’t been there in a month and I’m really missing it up there in VT! 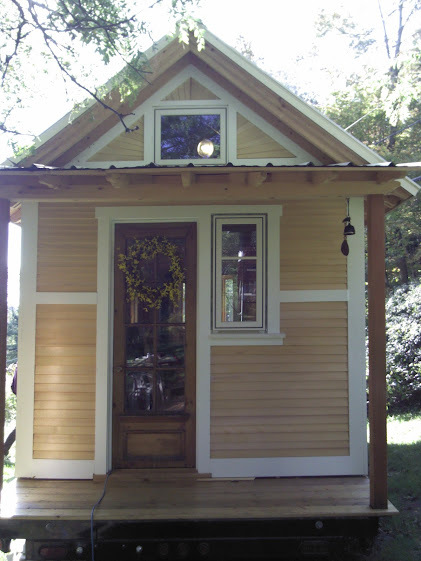 They have a Tiny House design course coming up soon, “Less is More”, which is taught by two wonderful instructors. Another tiny house built by Yestermorrow students! Okay, so as usual I have just a few minutes to post before breakfast and then getting out to the build site – but here’s what we did yesterday. In the morning we toured Susan and Emily’s tiny house in Montpelier VT. It’s the tiny house that last year’s Yestermorrow 2 week class built. They finished the exterior since and are now working on interior – plumbing, electrical, and finishes. I really like the details of their tiny house. It was a wonderful tiny tour. Also, back at the Yestermorrow ranch, we finished the floor (the finished floor – I’ll talk more about that later. There’s a few issues I have with the way we’re building this house, but I’ll go into it at a later time). We got our second wall up too! 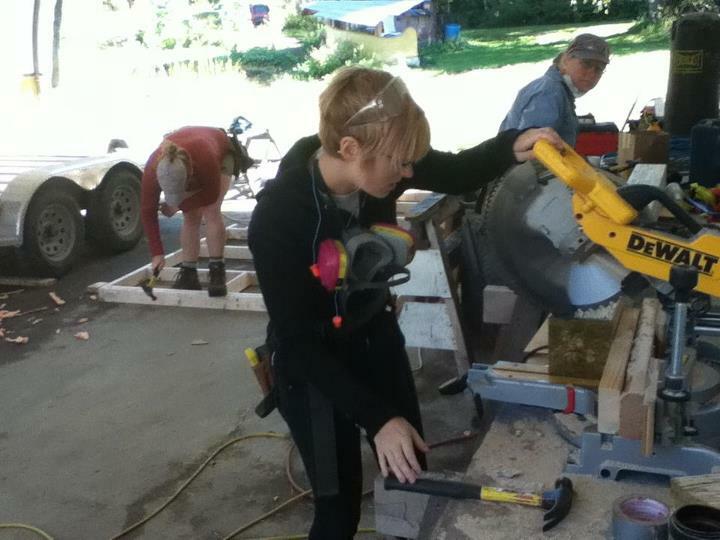 This is me at the chop saw. Best tool ever. All photos courtesy of Timothy Ettridge. Thanks Timothy! What a compliment! Thanks Timothy! Timothy and I are on similar paths. He is living in a trailer that he has re-done right now as he begins to build his tiny house on wheels. I think it’s a good approach! Last night I gave my lecture on Tiny House design and the details of my own project, as well as explained some tiny-house scale off-grid systems. It was really fun! 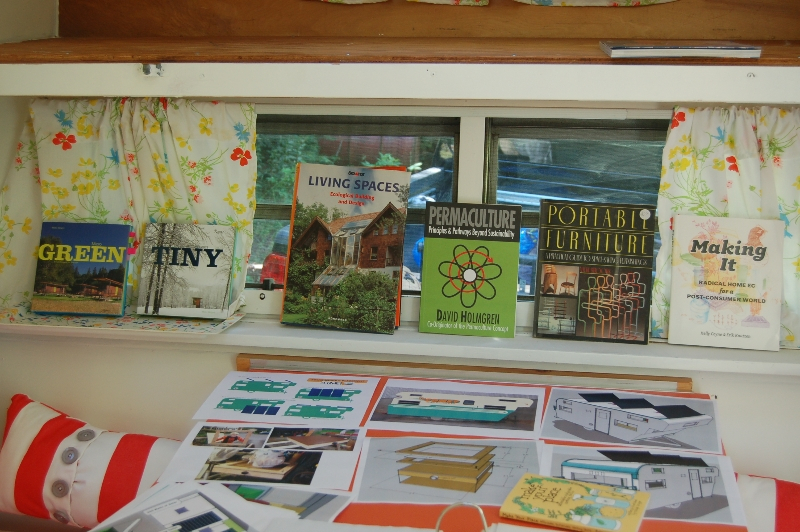 I hope to come back and talk again at future tiny house courses at Yestermorrow. No, I have not died or given up on the project or the blog, I am just finally, for the first time in weeks and weeks, finding a free moment to do a post. 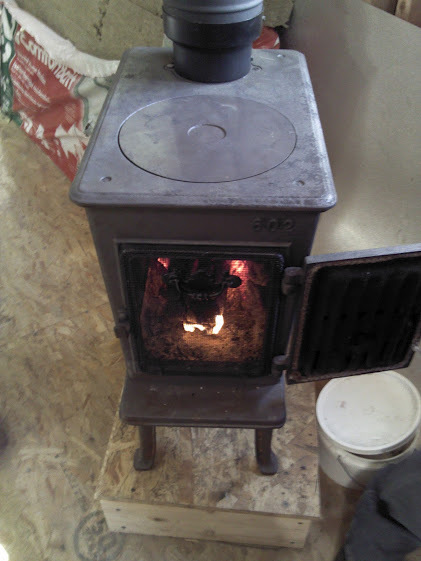 Things have been CRAZY the last few weeks, trying desperately to get the COMET in shape for Tiny House Summer Camp and then the Brattleboro KOA Vintage Trailer Rally. Basically I have not had a moment to myself since I got back from Yestermorrow on June 15th. Every single day (no lie!) for the last 6 weeks has looked a lot like this: wake up at 6 AM, be outside working on the COMET by 6:30 AM, work work work, take a 10 minute lunch break at 1, then back to work until 9 PM or sometimes later if I had to. All just to get the COMET in towable, working order (not pretty) for Tiny House Summer Camp (which was amazing) and the rally a week later. Did I mention the temperature has not gone below 95 that whole time? Needless to say, by 10 pm I was exhausted and I knew I had to put the blog writing on hold if I was going to make it up to Vermont for these two events. I want to THANK YOU for bearing with me the last few weeks as I put the pedal to the metal with the COMET in terms of progress, and was away from the website. It was actually really good to have a deadline and serious motivation for getting certain things done, and pushing myself that hard for the last 6 weeks makes the rest of the project, what still needs to be done, look like a breeze! 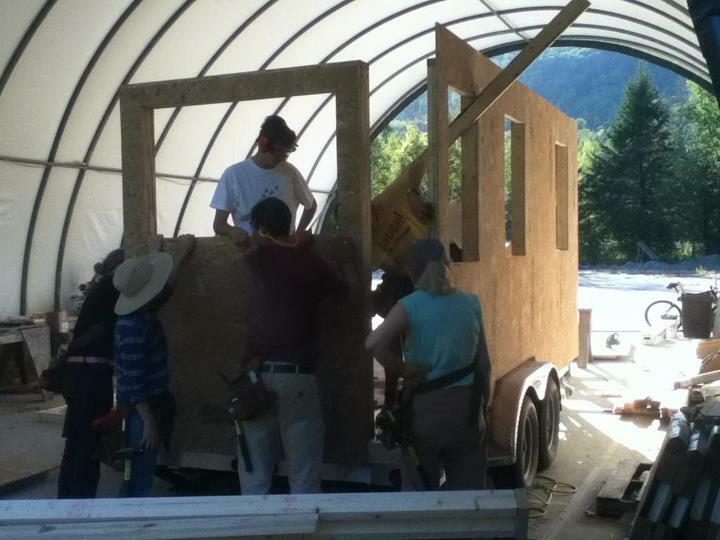 Tiny House Summer Camp – this photo is so tiny! But now I finally have a break, and no COMET events in the very near future, so I will be doing a LOT of catching up and filling you guys in this week. 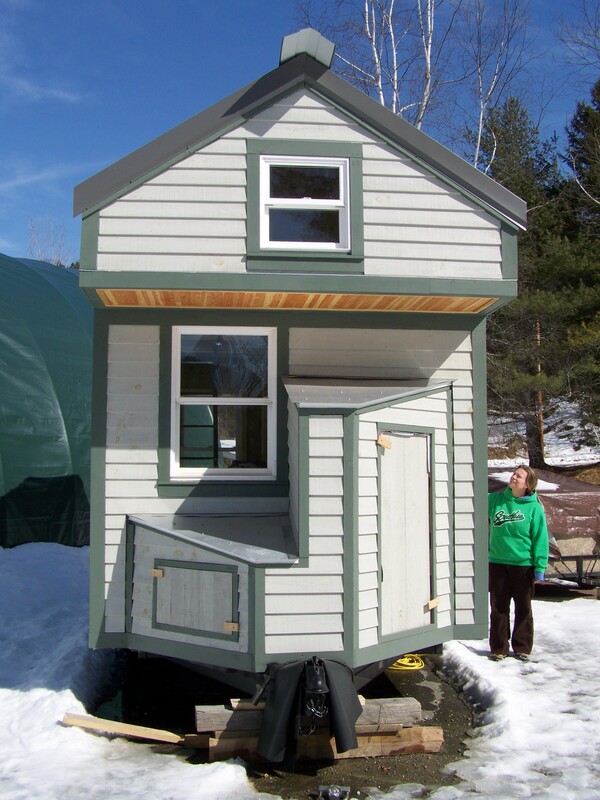 Expect to see step by step how the COMET went from a carpenter ant’s palace to a real, functioning tiny home (though it still needs a lot of work, I can at least stay in it for an extended period of time comfortably). I’ll also post about Tiny House Summer Camp and the KOA Vintage Trailer Rally, both of which were huge successes for first time events, and show lots of pictures!! It’s really interesting how the COMET fits into all of these different worlds and subcultures, somewhat seamlessly. Anyway, I’ll be catching up on the website this week so check back! Looking ahead, I am working on putting together and curating an exhibit at the Madsonian Museum of Industrial Design (in Waitsfield, VT, right near Yestermorrow Design/Build School). The exhibit is all about the designs that make up our summer vacations – think vintage picnic baskets, a plaid Thermos, canoes, swimsuits, and more. The exhibit will have a one day grand opening, with a show that includes vintage boats, cars, surfboards, a vintage swimsuit fashion show, vintage trailers, and more, followed by an exhibit in the Museum that will be up for a few months. If you have any vintage Summer Vacation items that you would like to see in a museum exhibition, get in touch! Also, if you have a vintage trailer that you would like to bring to the one-day show (or a teardrop that would fit into the museum) do get in touch! The event is scheduled for September 16th. Besides that, there is another vintage trailer rally in Salisbury Beach, MA in October this year that I’m planning on taking the COMET to. 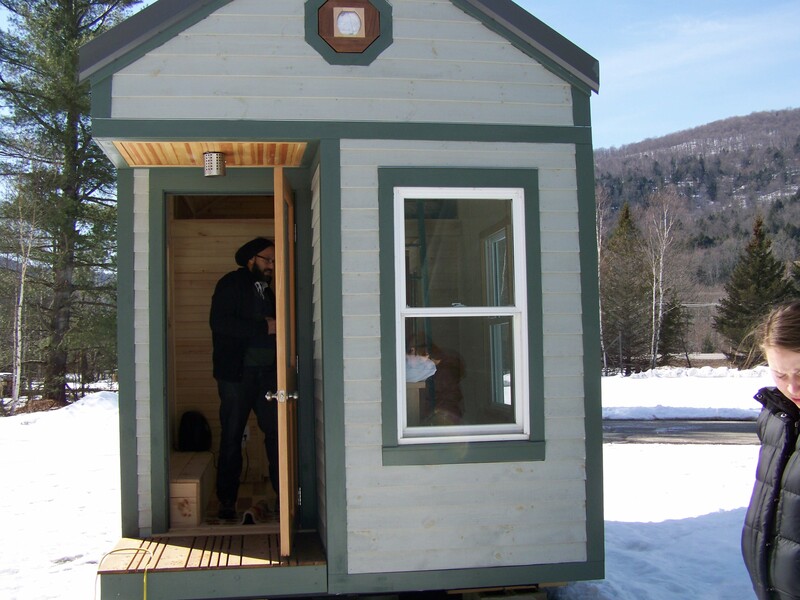 And another Tiny House Workshop with Derek Diedricksen in November (I think the dates are 2-3) at his home in Stoughton, MA. 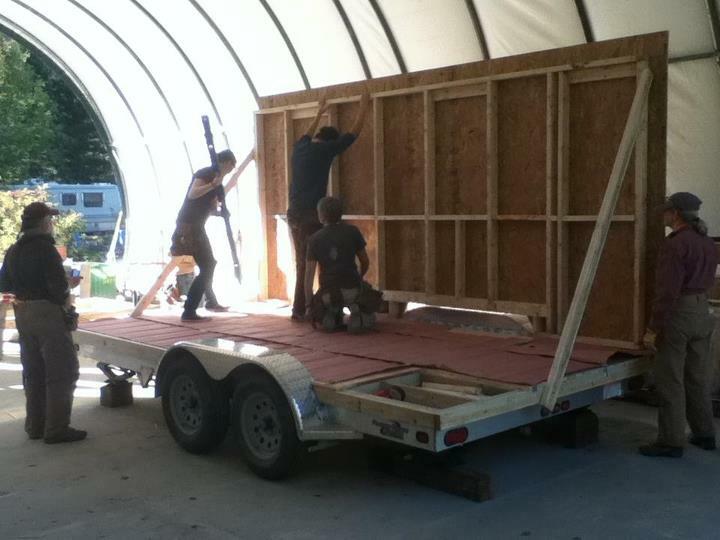 By November the COMET will be mostly complete – solar panels, bumper garden, and all the details of a lived-in tiny home. I’m looking forward to showing a more completed version of the COMET to people. I’m always a little nervous when people see her in the construction/mid-renovation state, I feel like I have to frantically explain that she will look better when she’s done, and that she isn’t complete so don’t judge it yet! Anyway, lots more in the coming days. I’ve missed my daily writing routine and can’t wait to get back in the habit, I have lots to share! I’m BAAAACK! And it’s crunch time for The COMET. Thank you all for your patience these last 2 weeks while I was at Yestermorrow fulfilling my Core curriculum in a VERY intense 3 weeks of classes. I was doing 20 hour days in the studio every day while I was there (not complaining – it was the most fun, creative, an productive 2 weeks of my life!) and just couldn’t keep up with blog posts on top of studio time and the occasional few hours of sleep. I love Yestermorrow, and would recommend it to anyone looking to further their knowledge in sustainable building, permaculture, or woodworking. What an awesome learning environment! And Vermont was gorgeous. 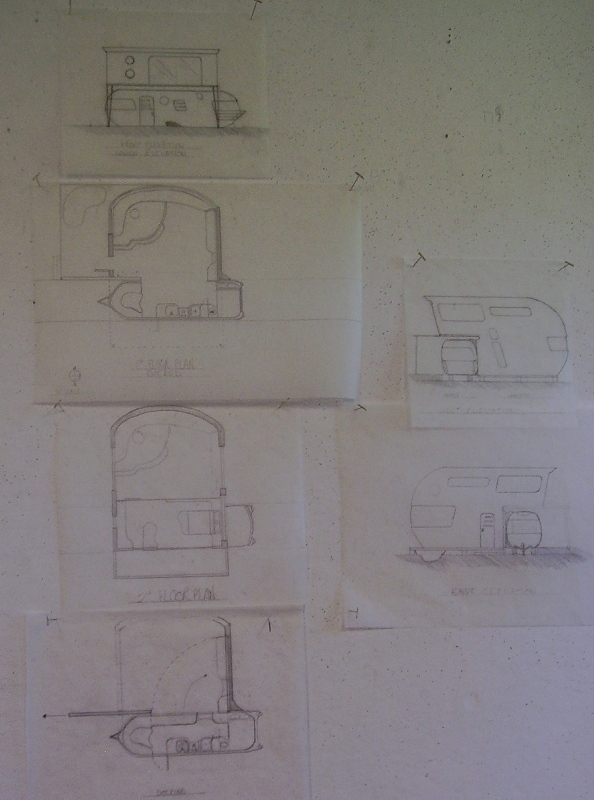 Below you can see some of my designs from the final week of class: it’s a camper and a tiny house – the camper docks into the tiny house and one wall of the camper swings open and becomes one of the walls of the house. Pretty cool! Maybe in the future I’ll build something crazy like this. 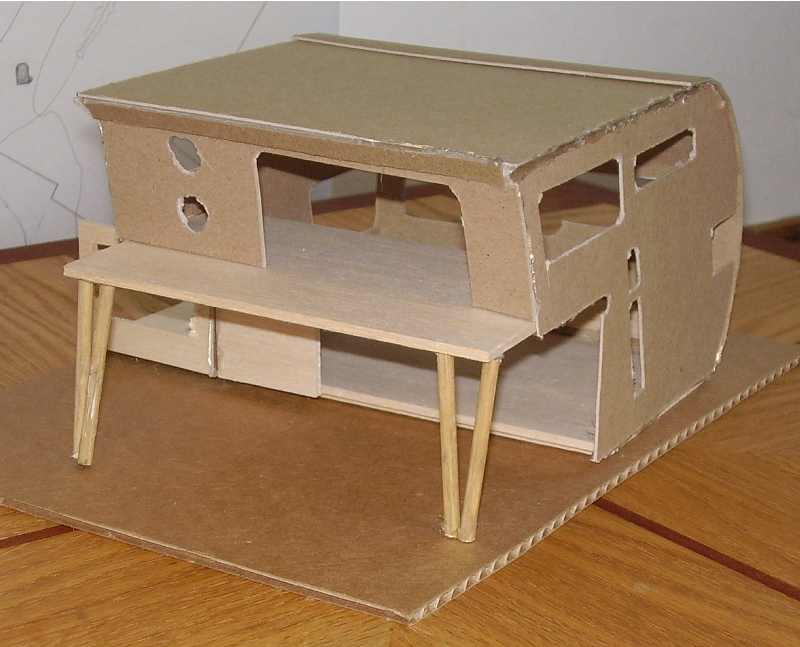 My model of the tiny house component. It’s supposed to look space-age! However, now I’m back in Massachusetts and it’s time to put the pedal to the metal with the COMET, because Tiny House Summer Camp is in 16 (16? 16??) days (that’s it, 16 days? – and check out the nifty countdown at the bottom of the page). I have tons of catching up to do here on the website (I saw many interesting things while I was in VT these past few weeks, and can’t wait to share stories and pictures with all of you) and in The COMET. 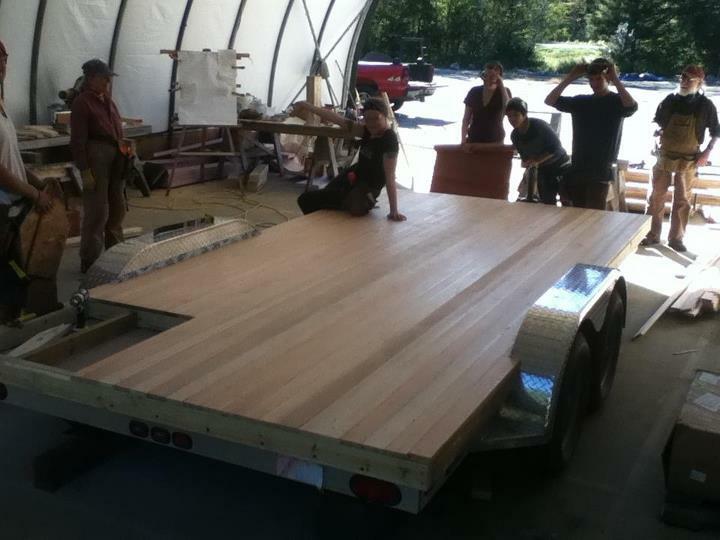 I have to have this thing that is very much mid-construction in somewhat presentable shape for the workshop in VT July 6th-9th (Tiny House Summer Camp hosted by Derek Diedricksen of Relaxshacks.com). Luckily (and I’m being facetious here) every time you are about to fix one thing in a vintage camper, you find 2 other things that are broken or damaged. For example, yesterday while I was getting ready to re-frame the rear wall in order to support a bumper garden, I found that the floor of the rear of the camper, under the bed/couch which is just storage, was totally soft. I pulled up the laminate and the floor just disintegrated underneath me, down to the frame. The joists disappeared. It was either termites of carpenter ants, but all they left was dust. So now I get to replace the floor of half of the camper and replace all of the rear floor framing around the two back corners. I’ve done this sort of repair before, and it’s always touch to get in to these spaces retro-actively and replace the structure that was put in first. LUCKILY (and I mean it this time) for me I have the greatest friend in the world, and I’ve enlisted my friend Matt (inventor, fabricator, builder, designer extraordinaire) to help me with the COMET the next few weeks in preparation for Tiny House Summer Camp. He did tons of body work yesterday while I pulled out rotten floor, and the exterior of the COMET looks good as new. All of the holes and scratches are filled and dents are pulled. Loads of pictures to come! Another HUGE thank you to Timbucktu RV in Worcester (1047 Southbridge St, phone # 508. 459. 1132), for the water tank and all of the other goodies for the COMET. If you’re looking for appliances for your tiny house or camper, or need any type of repair, give them a call. They’re the greatest. OH! And don’t forget about the vintage camper/tiny house rally on July 20-22 in Brattleboro VT at the Brattleboro KOA. Go to the Brattleboro KOA website to register your vintage camper, and all unique mobile dwellings get a discount! We have about 20-30 vintage campers already, it’s going to be a great weekend. Check out my EVENTS + APPEARANCES page on this website to see more details and find out about registering. I think I’m going to start getting more conceptual on this website sometimes. It’s my platform for expressing everything that goes into The COMET – which is so much more than solar panels and recycled materials and new technologies. My heart goes into it, my dreams (mostly daydreams) go into it, all of my time and energy. A lot of THOUGHT goes into it – more than can be measured. It’s completely consuming – and I love that about it. In a single, life consuming project I get to explore a world of possibilities and techniques and processes. An entire history of changing attitudes about the way we live. For the last few years professors have reprimanded me for being obsessed with technique and materials (what can I say, I’m a doer and a maker). They offered no alternative, but I understood that the way I approached design was backwards and too focused on minute details from the start. Today I had a major breakthrough. Woah. what do you want? Can you accurately express what you REALLY want out of your home (or another design)? 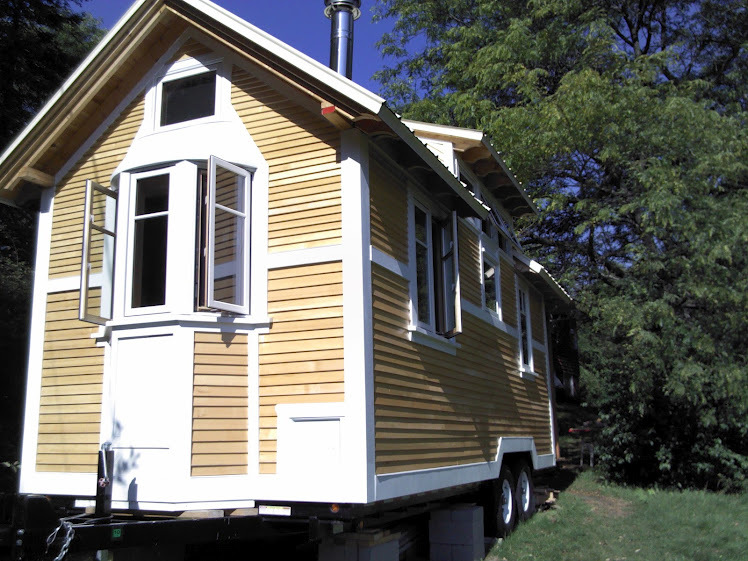 You want a tiny house, a big house, a cute house, an energy efficient house, or a fancy house? You want solar panels, a grey water system, and a composting toilet? I want more money in my savings account so that I can travel. I want to spend more time on interpersonal relationships. I don’t want to work all the time, I want to relax. 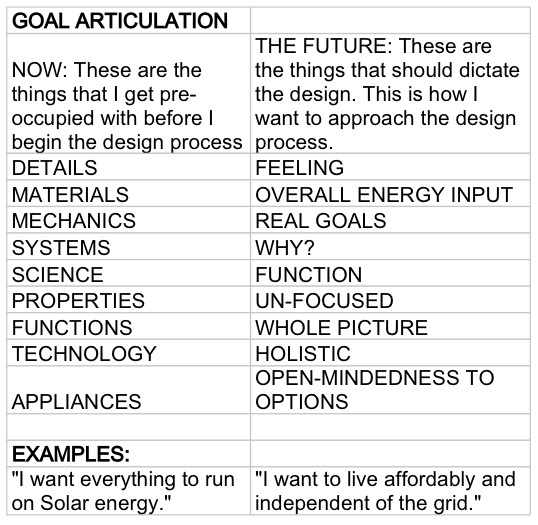 I was trying to articulate my goals for taking this Permaculture/Ecological Design course. (Talk about it using active, present tense). I just did some free-writing + listing to get started. – I have the tools to design a building/home in a productive landscape. – I can design with more than the materials in mind. – I understand how to actual goals versus superficial goals. – I can design buildings and homes that interact with the landscape and location. – I can articulate what makes a successful, functional home. – I can envision the whole picture. – I can design for leisure. – I can design a home with free time in mind and a low-maintenance landscape. – I can let the goals drive the design process, instead of the details. I hope this post was helpful to those thinking about designing their own dwellings. If we can establish what it is we really want out of our homes and our lives, the details will fall into place. It can be surprisingly difficult to express what we REALLY want out of our living situations, but I hope this sheds some light on that process! 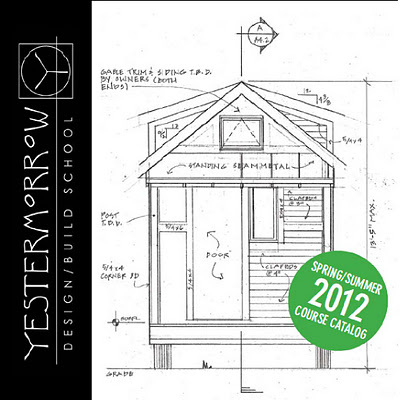 As some of you readers may know, I attend Yestermorrow Design/Build School in Vermont for certain workshops and courses throughout this year as I work towards my Certificate in Sustainable Design/Building from the school (also, as I receive credit at my college). It’s not a full-time school like traditional college, but instead I take a few weeks here and there throughout the year to do very intense, immersive, hands-on courses. My coursework here helps me with The COMET – each class that I choose to take is directly related to an aspect of the project. Today I start the most intensive course in the Certificate program (so I’ve heard), we call it “Core.” It’s technically titled Ecological Design in The Built Environment, and it is the basis of the curriculum here. It focuses on permaculture and sustainable community design, as well of the principles of design and basic design and drawing tools. It’s basically a semester long Design Fundamentals course packed into 3 very intense weeks (I think we have one day off). Just wanted to let you guys know what I was up to for the next 3 weeks. I probably won’t be able to post as much while I’m here, but look for some updates and a few posts about stuff I’ve been meaning to talk about for a while. It’s very beautiful up here in Vermont this time of year, especially at Yestermorrow campus. Thanks always for all of your support! The last 5 days I have been in a very intense class learning the ropes of PV installation. We’ve done sizing of a system (I haven’t done this much math since high school! 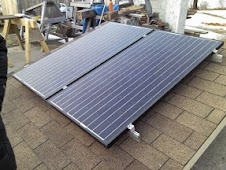 ), flash-mounted roof mounts, and we’ve wired up our solar panels. Based on my calculations, I think I have way more than enough PV power with the three panels I recently got from Cotuit Solar. Tomorrow is the last day, when we finally plug the panels into the combiner box (then charge controller, then AC breaker, then batteries, then inverter – whew!) and see how it all fits together. This class has been super enlightening and I can’t wait to share what I’ve learned. The Yestermorrow Design/Build School offers a learning experience like no other. It is really amazing here. Every person I meet is either building a tiny house (or has built one) or is working on an Airstream retrofit/renovation or already lives in an Airstream. My kind of people! Anyway, this is all I have to show you for now, more later! And here’s the tiny house that’s currently in the parking lot outside! 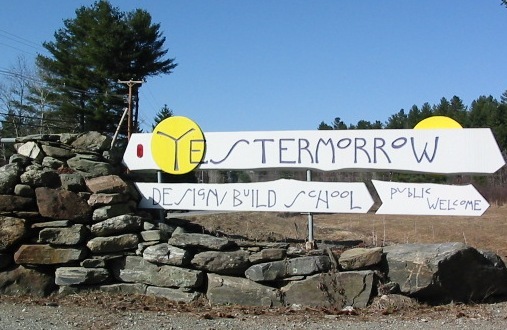 I have just arrived at Yestermorrow Design/Build School in VT for my Solar Electric Design + Installation course! I am very excited, and the class begins tonight, so we are jumping right in. I’ll be here for 5 days learning how to design and install a PV system for The COMET. My experience here will also come in handy when I help Beth Ferguson of Sol Design Lab (check out the pumps!) install a solar powered bus stop installation on campus at Hampshire College in Amherst, MA next month. For all of you sustainable design/green building fans: I was listening to “ACE On The House” (Adam Carolla’s carptentry/construction podcast) the other day and heard Ed Begley Jr., celebrity/environmentalist who was driving a solar powered car way before it was cool, talking about his new building project. He and his wife Rachelle are building a LEED platinum home (I believe it is net zero energy?) in place of their existing one. They have had their original home completely deconstructed so that each piece can be re-used in some way. Their new home will be “The greenest home in LA” and will be an example of sustainable building practices. They hope that others in the neighborhood will follow suit! I think this is a great idea. If more celebrities had more gardens and less lawns, people might be inspired to follow their lead. 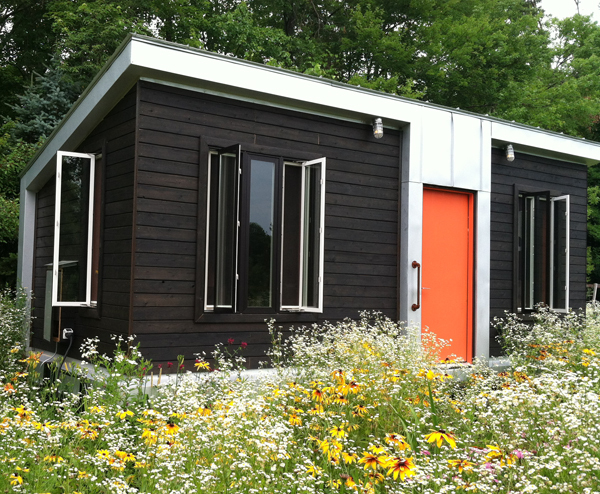 You can support their green building project via Kickstarter. They are asking for funds to be able to have a webshow that details “How to build a LEED platinum home”. I can’t wait to see the upcoming episodes!